Founded 1990 in Helsinki, AMORPHIS have worked their way to the apex of the European metal scene and won international renown. The band’s name, derived from “amorphous” (no determinate form or shape), has been programmatic for the pioneers of Finnish metal over the course of their 20-year career. Setting a diverse, intricate and unique style to their musical approach, often being described as “ahead of their time”, the band accrued a large and loyal international fan base. From their independently released demo “Disment of Soul” (1991) through the current releases, Amorphis have always fused elements of traditional heavy, death and doom metal with a great variety of non-metal influences, including folk, progressive and psychedelia, and managed to create an instantly recognizable sound of their own. The band’s break-through came in 1994 with “Tales From The Thousand Lakes“. The album won the band a massive fan base around the world, reaching a multitude of listeners among and beyond the metal community, and remains immensely popular to this day. In the early stages of their career, Amorphis consisted of Tomi Koivusaari (guitarist and original vocalist), Esa Holopainen (guitars), Olli-Pekka Laine (bass), and Jan Rechberger (drums). Together they greatly affected the metal underground, gained recognition and soon scored a multi-album contract with Relapse Records. Shortly after, Amorphis released their debut album, “The Karelian Isthmus“. Receiving an impressive response, the band chose to venture further into melodic terrain, adding progressive keyboard sounds here and clean guest vocals (performed by Ville Tuomi of Kyyria) there. The result was the classic “Tales From The Thousand Lakes“, which to this day is considered to be one of the most groundbreaking albums in the doom/death genre. For the first time incorporating lyrics from the Finnish national epic, the Kalevala, the album also was the first true manifestation of the influential Amorphis sound: a seamless combination of intoxicating melodies and aggressive sounds delivered with both clean and harsh vocals. The success of “Tales From The Thousand Lakes” provided Amorphis with the opportunity to tour the European continent several times, and followed by their first US tour in late 1994. Shortly thereafter, the band underwent some major musical and line-up changes. Continuing to feature lyrics based on traditional Finnish folk poetry, the third album “Elegy” introduced a new vocalist, Pasi Koskinen. 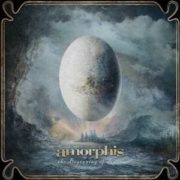 This adjustment proclaimed a significant transformation in Amorphis‘ career. Pasi’s unique vocals brought a new setting to the music, which now concentrated more on compelling keyboard atmospheres, psychedelic guitar sounds and a distinctive arrangement of the vocals, delivered by both Tomi and Pasi. Encouraged by popular and critical approval, the band members took three years to prepare their next album, honing the newfound style to perfection. 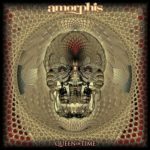 “Tuonela” was liberally sprinkled with 1970s-style psychedelic touches and marked another great leap ahead for Amorphis, and its successor, “Am Universum” delved even further into progressive soundscapes. In 2003, Amorphis released “Far From The Sun“. While closer to the band’s metal roots than the previous longplayer, the album was again very relaxed and melodic as ever, spiced with Far Eastern touches as well as progressive elements in the vein of Pink Floyd. In the late summer of 2004, long-time singer Pasi Koskinen left the band, and Tomi Joutsen (Sinisthra) joined around the end of the year. With a new singer and new energy, the band recorded “Eclipse“, an acclaimed masterpiece that combined the best-loved elements of Amorphis’ unique sound with fresh vigour. The album went straight to the top of the Finnish charts and was followed by triumphant live appearances all over Europe before the band retreated again to the recording studio. “Eclipse” was followed by “Silent Waters” in the late summer of 2007. The dynamic and emotional range of the new songs, all of which were based on a single episode from the Kalevala, went beyond any of Amorphis‘ earlier albums, yet at the same time hearkened back to the band’s past output in all its diversity. The release of the new album was preceded by a string of festival appearances – including Germany’s famous Wacken Open Air – and immediately followed by a five-week Finnish tour. The remainder of 2007 found Amorphis in Europe, Russia and Japan, whereas in 2008 they played in southeastern Europe, at a multitude of festivals and, during the fall, in the USA and Canada. The new album “Skyforger” shares the lyrical concept of the two previous albums, its central character being Kalevala blacksmith Ilmarinen. Musically, the band soars to unprecedented heights; not abandoning the cherished ingredients of their sound but rather refining them, augmenting them with fresh elements, and delivering them with breathtaking passion and intensity. Both the album and the single “Silver Bride” went straight to number one in the Finnish charts, and the live qualities of the new songs were immediately tested and proven on the summer’s festival stages. In September, Amorphis went on their first-ever tour of Latin America, followed by the extensive Forging Europe Tour in the fall. In the summer of 2010, the band presented its first-ever live DVD, which includes two full shows recorded in 2009 as well as a career-spanning documentary. The release coincided with the 20th anniversary of Amorphis, which in addition was honored by a compilation of re-recorded classic tracks, released in September 2010. Nostalgia, however, is not what this band is about. Granted, The Beginning Of Times (2011) showcases their trademark style in perfection, including plenty of reference to the death metal days, yet at the same time it proves that Amorphis have lost none of their progressive edge and experimental spirit. Doing honor to protagonist Väinämöinen, the Kalevala‘s central character whom myth credits for bringing music into the world, the band brought forth its most versatile and nuanced effort to date; in terms of performance and arrangements as well as rythms and sounds. Iikka Kahri, whose flute and saxophone already graced several songs on Skyforger, was back in the fold, Tomi Koivusaari added a few discreet touches of pedal steel guitar and Santeri balanced the 1970s prog and 1990s death elements with a synth vocabulary straight out of the eighties. More noticeable still was the addition of Netta Dahlberg’s backing vocals, which beautifully complement Tomi Joutsen’s lead – most poignantly on “Mermaid” and “Soothsayer” but also, for example, on the single You I Need. Besides another number one in Finland, The Beginning Of Times also earned Amorphis their first-ever Top 20 rating in Germany. The release of the new album will be followed by a world tour, starting with shows in the band’s home country of Finland, then other parts of Europe with Nightwish & Arch Enemy in November 2015. On May 18, 2018, they release their thirteenth album Queen of Time, and they announce an European tour for 2019 with Soilwork and Jinjer. With this album, we can note the return of the former bass player Olli-Pekka ‘Oppu’ Laine. 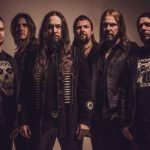 AMORPHIS & SLAYER Confirmed As Headliners For Tuska Open Air 2019! AMORPHIS – Release Fourth Album Trailer! 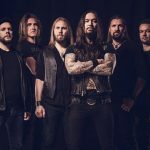 AMORPHIS – Unleash New Music Video For ‘Wrong Direction’! Amorphis released second album trailer. 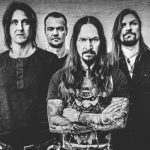 Amorphis will release new album on May 18th! 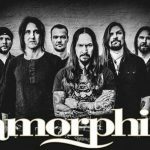 AMORPHIS – working on new studio record! DISCLAIMER! None of the tourdates presented on this page belong to Nordic Metal. All the tourdates content belong to Bandsintown. We are using their data through a written consent between Nordic Metal and Bandsintown. Tourdates are shown as they are and Nordic Metal is not responsible for any false information.